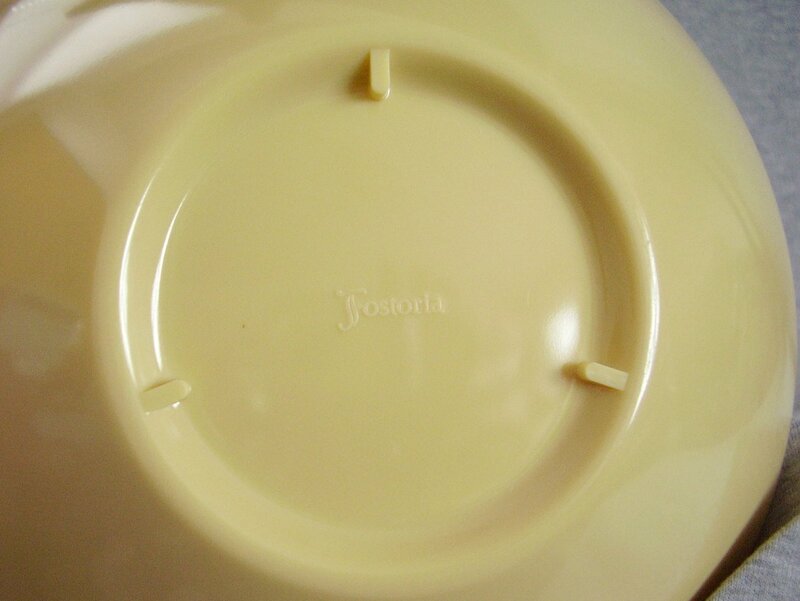 Fostoria melamine large serving bowl or dish. It is an egg shape or oval shape made in a buttery yellow color. Bowl measures 9 inches x 9 7/8 inches x 3 1/8 inches tall. 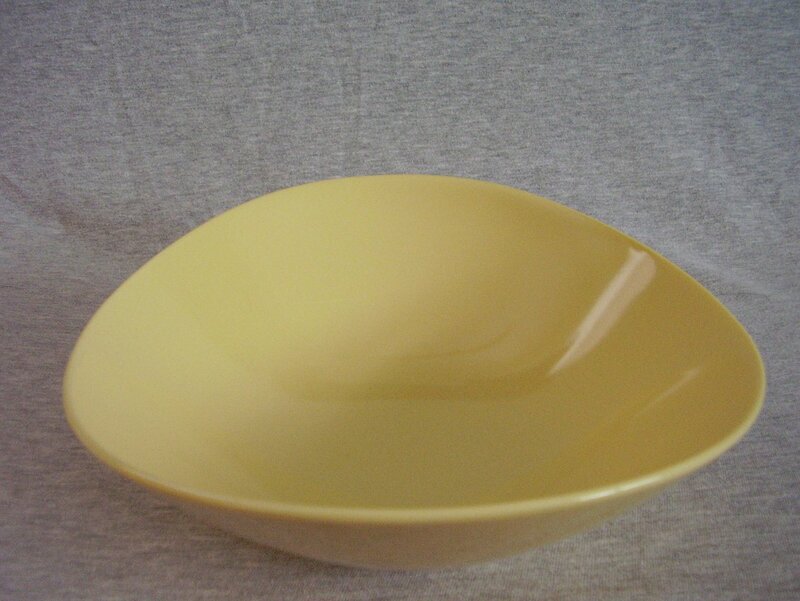 Fostoria melamine large serving bowl or dish. It is an egg shape or oval shape made in a buttery yellow color. Bowl measures 9 inches x 9 7/8 inches x 3 1/8 inches tall. The dish is in wonderful vintage condition with only a couple of slight scuffs to the plastic and some utensil marks inside. No chips or breaks. Bears the Fostoria name on the bottom. Fostoria Glass made Melmac dinnerware for a short period of time in 1958. It had the same backstamp logo that the company's glass factory used. References can be found in the book, Collectible Plastic Kitchen and Dinnerware. It is a very collectible item with the Fostoria name linked to it. The melamine items that were made all have that retro, atomic look. 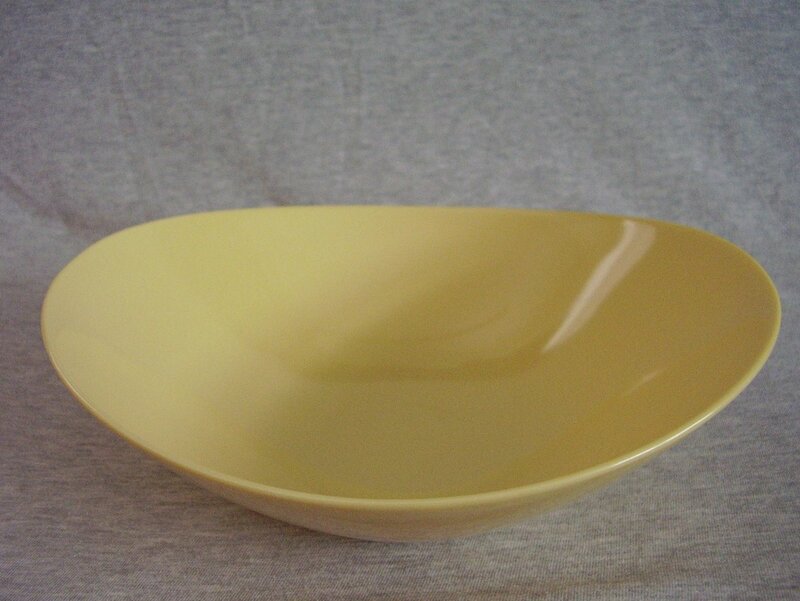 Wonderful plastic serving piece especially for those decorating in the retro, atomic look or for outside parties where plastic is a better choice.